As I pass the supermarket tasting booth and the woman giving out chicken samples I say with an insincere smile “No thanks, I don’t eat slaughterhouse products.” Or at least that’s what my evil twin says. It’s a dilemma. When I see those bits of chicken, I also see the de-beaking process. I recall the worker grabbing the legs of three struggling chickens with each of his hands. I hear fragile chicken leg bones breaking as a result of their forced and speedy growth to a “marketable” size. I recall the endless slaughterhouse conveyer belt line that takes both “free range” and the even less free chickens to their painful end. I’ve watched, on Franklin Street. Yet I suspect that my “shock value” response to the woman at the supermarket does little good for her, for me, or for the unfortunate beings that we classify as “food animals”. My response is ineffective because its root is righteousness. I fling my righteousness across the supermarket aisle. It’s not unusual for me to later discover that the person I scorned as “less vegan than me” is extremely compassionate and that she gives to children in ways that would never have occurred to me. Or that her environmental awareness and activism are exceptional. Or that her kindness extends to a large family, and beyond. Thus my less evil twin remembers the Dalai Lama and simply says a truly warm and friendly “No thanks, I’m vegetarian,” as I pass the sampling booth. Fortunately my son Chris and several good friends help me to keep my righteousness in line. Like many families, mine has mixed dietary preferences. My daughter was vegetarian before I was. Chris, while sympathetic, has never become vegetarian but is, in many ways, one of the most ethical people I know. I recall family dinners at which several would dine at the vegetarian restaurant at Broadway and Trafalgar and one of us would get a burger nearby and later join us for dessert. Over the years my family members watched each other’s choices, took note, allowed for differences, and gradually learned from each other. The combination of respect for my own values and for the people around holds the most promise for maintaining outward and inner peace. It is the diplomatic solution likely to maintain bridges rather than create barriers with those I love. While my family grew, with each member evolving in his or her own way, my dietary preferences gradually shifted from meat-eater, to lacto-ovo-vegetarian, to a vegan. If I am to respect others, and to respect myself 30 years ago, I must come to terms with all these choices. In practical terms, how was this expressed at the dinner table? For years, the following four standbys provided us with teen-friendly food on a regular basis. Tacos. The basics are acceptable to everyone and happen to be vegan: tortillas, mashed avocado, lettuce, chopped tomato, taco sauce, and seasoned pinto beans. Corn tortillas are welcome for those with wheat allergies. Grated cheese and seasoned meat are optional. Tacos allow people to create their own combination. Pizzas. Our childhood birthday celebrations have often been “create-your-own pizza” parties. Pizza dough, tomato sauce, sliced mushrooms, tomatoes, green and red pepper, olives, veggie pepperoni, and pineapple are vegan basics. Cheese or salami are toppings for some of the group. Spaghetti. Spaghetti can be served with optional tomato or meat sauce, and parmesan on the side. Burgers and hot dogs. The combination of a veggie burger or dog in a whole grain bun is surprisingly healthful choice, offered with a selection of toppings such as mustard, ketchup, barbecue sauce, relish, chili sauce, tomato slices, dill pickles, onion, avocado slices, lettuce, sprouts and a tasty mayo such as Nayonnaise. 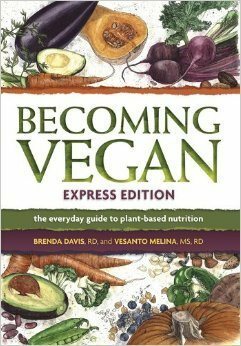 Meat eaters can have their patty along with the full spectrum of vegetarian fixin’s. With time, my recipe collection and cooking skills improved. My family and friends, including those who are not vegetarian, have come to trust that my plant-based offerings will taste good. 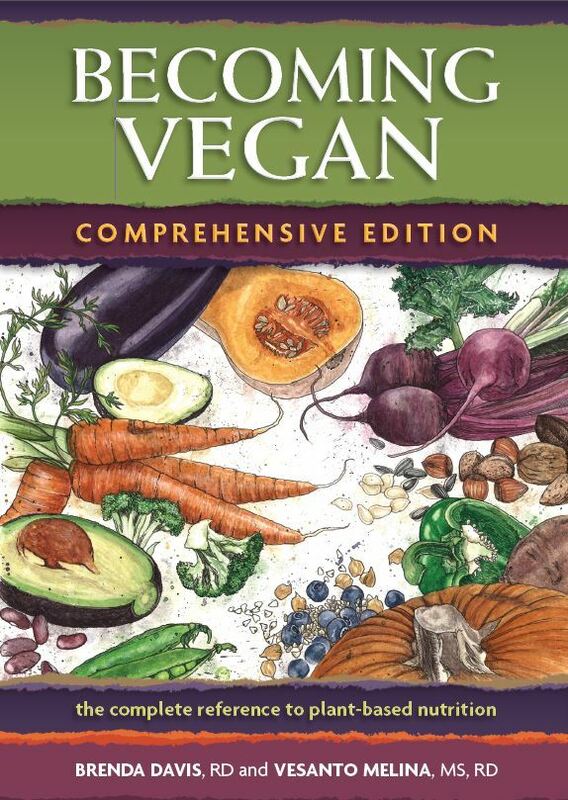 The marketplace increasingly supports vegetarian choices. And I’m gradually learning to let go of righteousness. 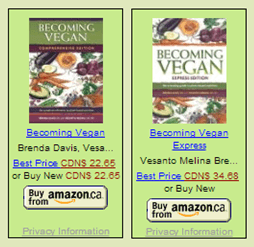 Vesanto Melina, registered dietitian is an author of food and nutrition classics (Becoming Vegetarian, Becoming Vegan, Raising Vegetarian Children) that include powerful sections on dealing with our dietary differences. For personal nutritional consultations, call her home office (604-882-6782). Website: www.nutrispeak.com.